The day after we got back from our holiday travels, I popped in to a nearby Aldi store. Every week they have "special buys", and sometimes they can be bargains. What tempted me in was the idea of a relatively low-cost battery-operated LED light, with an infra-red remote control. I bought one, but I haven't done anything with that yet. Something for a future blog post, I suppose. 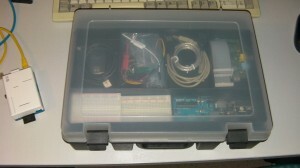 While looking for the LED light, I came across what Aldi describe as a "Hobby Storage Case". Although the pictures all show it filled with paints and craft materials, it looked a good fit for some of the electronics bits and bobs I have scattered around my desk. So I gambled £3.99 and bought one. When I got it home I realized just how good a match it is for what I needed. The top tray has four equal sections, and a wide slender one. The four sections are nicely sized for a Raspberry Pi maybe with a small expansion board fitted, or in a case, or with a cable or two. 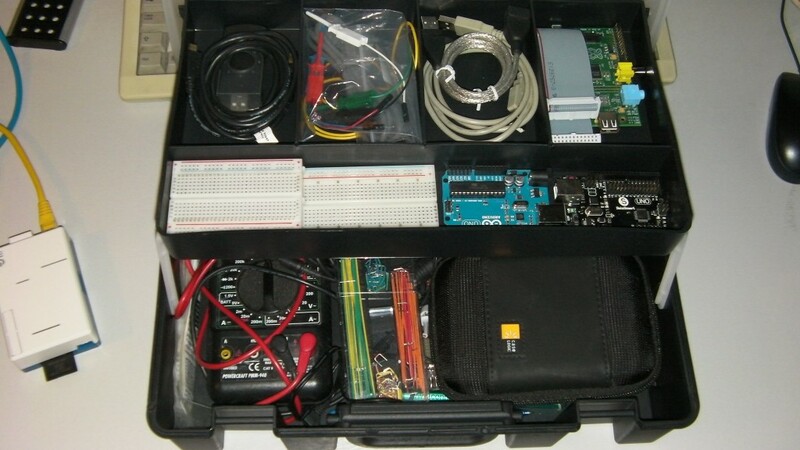 The slender section is a perfect fit for standard sized breadboards and Arduinos. 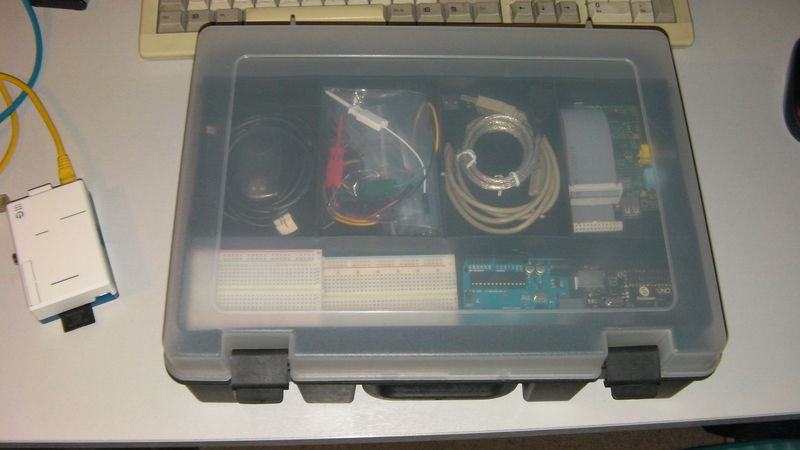 When the case is opened it reveals a lower section in which I have put a multimeter, my Saleae logic analyser and a selection of wires and components. The whole thing closes solidly and has a carry handle for portability. I heartily recommend this box, particularly at this price. It's hard to imagine one with better layout and size. Why not see if your local Aldi store has any left?